Vincent Price’s floating head appears and narrates the premise, and his fey performance as millionaire Frederick Loren makes us wonder whether this movie was meant to be a black comedy. He tells us he is offering $10,000 each to five strangers who will spend the night at this house he has rented for his wife to throw a “haunted party.” Immediately, I don’t get it. What is his motive to pay the guests, unless it’s some kind of challenge to stay through some actual haunting? Even then, what’s in it for him to pay them? Does he get publicity, back-end points on some other property – what? What is his wife’s connection to the money? What will she gain if the people stay the night and Loren pays them? Loren tells us that if they die during the night, their next of kin are paid, which means he’s out $50,000 no matter what. The only person who’s being haunted here is his accountant. The guests arrive in funeral cars: a pilot (Richard Long, smugly Brylcreemed), a writer (old Julie Mitchum, with her handbag riveted to her forearm as if she’s wandering a sale at Macy’s), a doctor (Alan Marshal, looking like George Raft), a drunk B-actor (Elisha Cook Jr.) and a young typist with a pointy bra (Carolyn Craig, from GENERAL HOSPITAL). Loren’s wife is the stately Annabelle (Carol Ohmart, whose regal bearing reminds us of Meryl Streep, and whose acting reminds us she’s not), who disdains her husband’s wishes to host the party and who suspects he is plotting against her, as he did with his other 4 deceased wives. Renowned B-movie director William Castle helms this rickety cliché and writer Robb White pulls out every horror convention of the day: doors slamming by themselves, blood dripping from the roof, isolating people in basements, screams from other rooms, secret passageways, apparitions, lights being blown out, and people entering rooms by opening and closing doors. Lots of opening and closing of doors. I swear to god I’ve never seen a movie with this much opening and closing of doors! It’s like the director never trusted us to understand that if someone appears in a room, they must have used the door to enter. No, we’ve got to see them physically, either in establishing shot or cutaway, enter through the door and close it behind them, as if being neat and tidy! Even when Pointy Bra is screaming her head off, she runs out a door and closes it behind her! Oh, and did I mention there’s a giant pit of acid in the middle of the basement? No one’s gonna fall or trip or be pushed into that – no way! (So the house has been unoccupied for years since the murders took place here, so who has maintained this giant pit of acid all these years? And – WHY maintain a giant pit of acid in an unoccupied house? Wouldn’t it be more sane to DRAIN the giant pit of acid just for the sake of safety, or sell the giant pit of acid to a school or lab?) The six-year-old who wrote this script must be old enough now for me to go over to his house and punch him in the head. 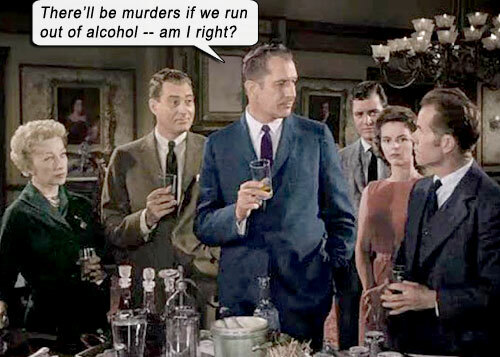 HOUSE ON HAUNTED HILL is one of those movies where things could go a whole lot smoother if people would just react like real people. For the sake of planting doubt that Loren might be trying to knock off Wife #5 – Annabelle – story is rife with red herrings and false leads. There is incessant talk of “ghosts” and deaths. But no one reacts to any situation remotely believably: if your life is threatened, don’t plan to “lock ourselves in our rooms and shoot anything that enters” – stay together in that gnarly old living room with all the lights on! If there’s an open pit of acid in the basement, firstly, close the frickin’ pit, then lock the basement and don’t go down there! Etc. Constant unrealistic behavior is augmented by hokey photographic effects and rudimentary “special effects” that badly date and ruin this movie which might have once been a tad chilling for boys and girls in 1950’s white Brylcreemed America. Everyone is in suits that they just – won’t – take – off, and there’s much annoying high-pitched screaming from the dames. And there’s the blind caretaker who just decides to stand in a position like a dummy from Madame Tussaud’s in horror-movie-stance; we can forgive her that electroshock hairstyle (she is, after all, blind), but who exactly is she trying to impress by gliding across the floor with her hands clawed? And in all the opening and closing of doors, there’s Richard Long with the only adjoining door – aching to use his long richard on little miss Pointy Bra. The twists in the plot are almost lost in the wooden shuffle between rooms, and opening and closing of doors. And there’s some insane stuff that involves either real magic or real ghosts – like the rope coming into the room and wrapping itself around Pointy’s legs by itself, while Meryl Streep floats outside Pointy’s bedroom window amongst the thunder and lightning. Best thing to do in a situation like this is to stand perfectly still and watch it happen, which she does, instead of running or even moving her legs a little, so as to let the special effects team get their job done. The best/stupidest/funniest effect must surely be the skeleton rising up out of the acid to haunt Annabelle into tripping/jumping in. Poor thing must not have seen the wire attached to the top of its head pulling it up, like we could. Starring: Vincent Price, Carol Ohmart, Richard Long, Alan Marshal, Carolyn Craig, Elisha Cook Jr., Julie Mitchum, Leona Anderson, Howard Hoffman.